How not to learn trail-braking. 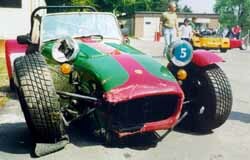 The 3rd of May 1999 was a gorgeous day for the Lotus Seven Club's Cadwell Park track day. I spent the previous day at the Stoneleigh Kit Car Show, and then travelled up to Cadwell with two other Sevening friends. On the Monday morning, after a brief, fruitless, search for a purveyor of Super Unleaded, we headed off to the circuit. I had got through the first session unscathed, and was just about up to full speed, when something happened at the entry to Hall Bends. Before I knew it, smash, I was in the barrier. There is virtually no run-off at this point of the track, so when the back of my car overtook the front, there was nowhere else for it to go. Looking back on it, I think I must have been braking a little bit too hard, which must have unsettled the car. This car was always more twitchy than the others, but it chose a poor place to bite. I stopped the engine then jumped out of the car pretty smart-ish, just in case anybody else came along and did the same thing. Other than being shaken up I felt fine, but agreed to be taken to the medical centre (in an ambulance!) for a checkup. After that it was back to the paddock to apologise to the Clerk of the Course for ruining everyone else's day, and to inspect the damage. The AA agreed to come out (after I convinced them that I hadn't been racing - the fact that it was on a track didn't seem to bother them). A bunch of volunteers helped get the car on the back of the truck (thanks guys), and then it was a long drive back down to Binfield. The front right side was toast (including the suspension bits, headlight, nosecone, radiator, cycle wing), as was the front of the chassis up to the front of the engine. The sump was battle scarred, and closer inspection revealed that the side chassis tubes were bent due to the wheel smashing into them. It was decided that fitting a long-front chassis was the right thing to do (the work was done by Arch Motors), along with a re-spray. Altogether this cost about £7000 to fix. Luckily I had taken out specialist insurance just for the day. It had seemed expensive at the time (£80 for the day), but it turned out to be very good value... I have only good things to say about the insurance company (Egger Lawson) - I arranged the policy by phone and fax at the last minute, and despite having nothing in writing from them when the crash occurred, they were extremely helpful in settling the claim. All they wanted was photographic evidence of the damage, an itemised quote, then more detailed photographs of the broken bits as they were removed from the car. I still have this Seven, and I have no plans to sell it, so don't worry about trying to avoid it. This page is http://www.strangely.org/owned/cadwell_oops.html. It was first published on Wednesday 17 May, 2000 and last updated on Wednesday 17 May, 2000.